My husband, given a choice, would pass up almost every great dish I make in favor of a pasta dish – and if possible, a baked pasta dish of some sort. I joke about the popularity of the tongue-in-cheek blog post I did about his baked rigatoni pasta dish, but that’s just what he likes. So I decided to make something I knew he would like, but to sneak in a little more excitement (that means hide vegetables in it). 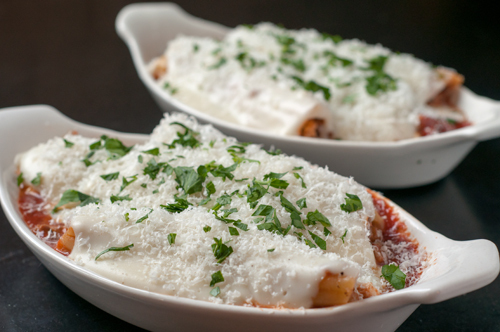 You can make the cannelloni in individual baking dishes, or just line them all up in a couple of glass baking dishes – either way works. You prepare a filling first – in my case bison (beef), mushrooms, carrots, fennel, onion, garlic, and some diced fresh mozzarella cheese – and then par-cook the cannelloni shells. 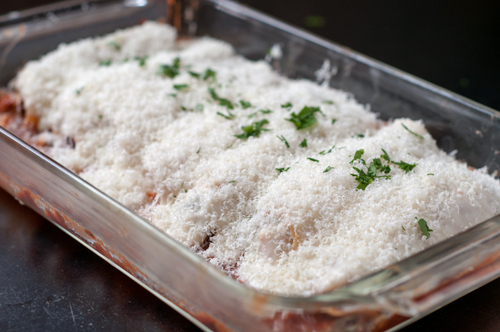 Spread some marinara sauce on the bottom, layer the filled cannelloni over the sauce, then smother the entire thing in bÃ©chamel and some grated Parmigiano Reggiano cheese. They bake off in 30-45 minutes, and you’ll have not only a satisfying dinner for tonight, but leftovers you can freeze for another day. I just celebrated my 29th anniversary with my husband – and I know he loved that I made this for him! Heat the oil in a large skillet over medium high heat and add the carrots, fennel, onions, and mushrooms and sautÃ© until slightly softened, about 10 minutes. add the garlic and ground meat and continue to cook until completely browned. Season with salt and pepper to taste and stir in just enough marinara sauce to coat everything, about a cup. Let cool slightly and then stir in the mozzarella. 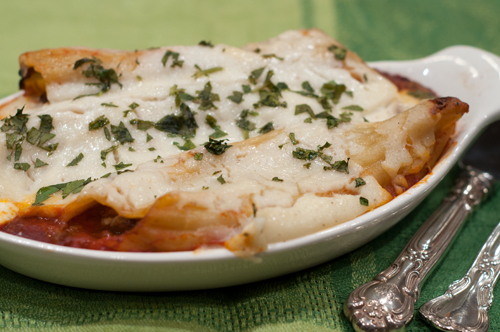 Cook the cannelloni shells in a large pot of heavily salted water for 2 minutes less than the package time. Drain and cool under running cold water. Spread the remaining marinara sauce on the bottom of your baking dishes. Stuff each cannelloni shell with filling and lay flat in the sauce, lining them all up right next to each other. Heat the butter and flour together until well mixed and cook for 2 minutes to remove the raw flour taste. Slowly whisk in the milk until it's nice and creamy and smooth, and then season with nutmeg, salt, and pepper to taste. Pour the bÃ©chamel sauce over the top of the cannelloni, and then grate the Parmigiano cheese over the top and garnish with the parsley. Bake, lightly covered, until bubbly and cooked through, about 30 minutes.